Well, between life and the fact that a lot of mushers dropped out I did not finish this year. 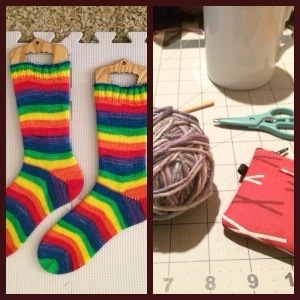 I still haven’t finished and I moved on to finishing my 5th and 6th pairs of socks for the year. The weather started to get nice and I figured I wouldn’t wear the sweater for awhile anyway. It’ll get done just not now. I’m also sans internet right now while we wait for Windstream to set up service tomorrow so iPhone photos will have to do. 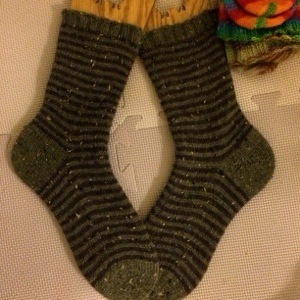 The top pair of socks are made from Knitpicks Stroll in two different tweeds (have to check on the exact names). I love how these came out. I missed the Stroll tweeds when they were discontinued a few years ago and immediately ordered these two balls when I saw it back in stock. I switched colors every two rows and they just make me so happy. I used the Fish Lips Kiss heel and thoroughly enjoyed it. through another pair in Chocolate Bunny Cake. Hopefully those will be done by Easter. I finished another pair in between in Desert Vista Dyeworks that are blocking as I type and I’ll show those in my next entry. Seven pairs so far this year and by the end of the month it should be nine! Either way I’ve been keeping busy. I’m hoping I have some good news to share soon about a new edition (no, not pregnant!). Until then happy knitting!